A friend of mine took a candid photo during a CrossFit Workout and the girl was made fun of all day long for it. Bad form. Facial expression. Funniest caption. I felt awful. With every comment, I couldn’t help but feel worse. Sure it was all in good fun. Community of tight-knit people, these comments were not serious, but I still felt really bad. You could say, I’m just a tad on the über sensitive side. Just a tad. I burden myself with other people’s feelings. It may sound like it, but I’m not talking martyrdom. I’m just talking way too much sensitivity. A little too serious. In my mind, I felt so bad because I mistakenly thought she had been caught in a moment of weakness. But now I realize that what was captured was a moment of great strength. She was lifting more weight in one day than some people lift in a lifetime. She was trying. She was risking it all. She wasnt thinking about perfect she was thinking about doing. That, my friends,is courageous. It’s remarkable. How many of us spend time wishing and hoping and dreaming – isn’t that a song – but rarely doing? Don’t we make lists and dream up projects to do at work, at home, with our kids, for ourselves, in our marriages and they remain just that, a list? I do. I’m a list maker. Mostly because I like to check things off, but really I just love to make lists. I love to plan and organize but it stops at the list. The big lofty ideas don’t get completed, not even attempted some times. So I don’t feel so bad about the picture anymore. I feel lucky that I was able to see that moment of strength. It inspires me to do and be and not just make lists. 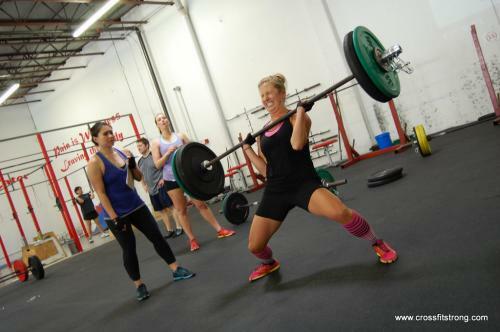 This entry was posted in Life Lesson and tagged Compete Every Day, Crossfit, Photography. Bookmark the permalink.